The Global Volcanism Program has no activity reports for Hainan Volcanic Field. The Global Volcanism Program has no Weekly Reports available for Hainan Volcanic Field. The Global Volcanism Program has no Bulletin Reports available for Hainan Volcanic Field. The Hainan volcanic field consists of Quaternary lava flows that extend over about 4100 km2 of northern Hainan Island (also known as Qiong). This field, along with the Leizhou Bandao volcanic field across the Qiongzhou strait to the north on the Leizhou (Liuchow) Peninsula, forms the larger Leiqiong volcanic field (also called the Qionglei volcano group). As many as 58 cones and craters are still evident, primarily near the city of Hainan on the north-central coast of the island. Historical eruptions were reported in the Lingao and Chengmai areas in the 19th and 20th centuries. Leihuling and Maanshan, two of the best preserved volcanic cones, are oriented along an E-W fracture and are part of a cluster of about 30 cones in the Shishan and Yongzing regions. The Haikou Volcanic Cluster, part of the Leiqiong World Geopark, around the town of Shishan 15 km SE of Hainan city, includes 40 volcanic features. Chen S (ed), 1986. 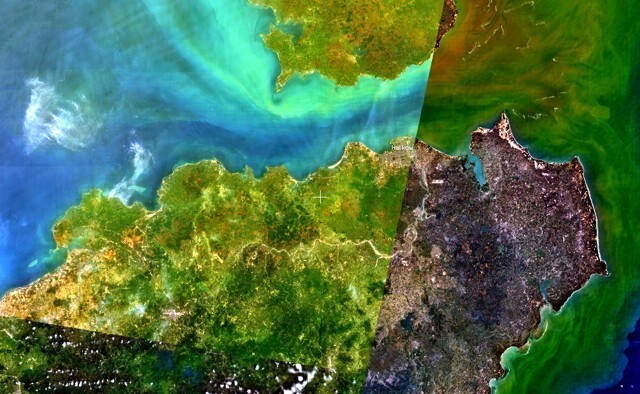 Atlas of Geo-Science, Analysis of Landsat Imagery in China. Beijing: Chinese Acad Sci Press, 228 p.
Latter J H, 1986. (pers. comm.). Liu J, Taniguchi H, 2001. Active volcanoes in China. Tohoku Asian Studies, 6: 173-189. Whitford-Stark J L, 1987. (pers. comm.). Whitford-Stark J L, 1987. A survey of Cenozoic volcanism on mainland Asia. Geol Soc Amer Spec Pap, 213: 1-74. There is no Deformation History data available for Hainan Volcanic Field. There is no Emissions History data available for Hainan Volcanic Field. The Hainan Dao volcanic field (center) stretches across the northern part of Hainan Island. It covers about 3600 sq km of the northern part of the island (also known as Qiong Island), across the Qiongzhou strait from the Leizhou Peninsula (top-center). The Hainan Dao volcano field is of Pleistocene-Holocene age, but historical eruptions were reported in the Lingao and Chengmai areas. There are no samples for Hainan Volcanic Field in the Smithsonian's NMNH Department of Mineral Sciences Rock and Ore collection. Large Eruptions of Hainan Volcanic Field Information about large Quaternary eruptions (VEI >= 4) is cataloged in the Large Magnitude Explosive Volcanic Eruptions (LaMEVE) database of the Volcano Global Risk Identification and Analysis Project (VOGRIPA).